I can see why, at first glance, it might seem that way. 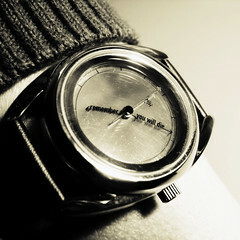 It is “the most accurate wristwatch you can buy” not because of the mechanism, but the philosophy: “the hour hand reads ‘remember’, the minute hand ‘you will die'”. No, really, it’s not morbid. It’s called The Accurate, and it came in a spiffy box via Royal Mail. The Mr Jones Watch people pay attention to packaging, and tell a good story. I’ve been looking for a watch for a long time now. Years, actually. I’ve seen some I like, but they all keep being not the right one. The Yes watches came damn close, but are expensive. They have one hand instead of two and track hours of daylight. See, what I’ve been after is something that doesn’t just tell me what time it is, but prompts me to think about time differently. One hand spanning the face every twenty four hours would do that; a graphical display of daylight hours left would do that; I think ‘remember’ and ‘you will die’ circling will do that. The highly reflective face functions as a mirror, so when I glance at the watch and see the message I can, if I choose, see my eye reading it. It isn’t about the fifteen minutes left in a meeting or the ten minutes I’ve been waiting for a train or the five minutes I’m already late or the eight minutes until the movie starts. It’s about realizing that time is life energy, and it matters how I spend it. I’m not interested in developing an overly obsessive, be productive every second mindset — that would make me pretty miserable — but in a how am I spending this day, this week, this season, and is it how I really want to be spending it mindset. It’s about being present now, and remembering the future is uncertain but finite. We never really know what time it is. That watch, and your reflections on it, are beautiful! If I wore a watch, I’d be all over it myself. Oh, that is all kinds of awesome!